I signed up to bring a baked good to my daughter’s daycare halloween party tomorrow. I had planned to make some cute cupcakes, but was disappointed when I saw someone else was bringing in cupcakes. I guess it all worked out in the end since I have a very stressful week at work and brought work home every night this week..so not fun! Anyways, I decided to make cookies earlier this week and wanted to go with some somewhat healthy. These are super easy to make and taste yummy! I had to sample a few before I packed the up to make sure they were ok! 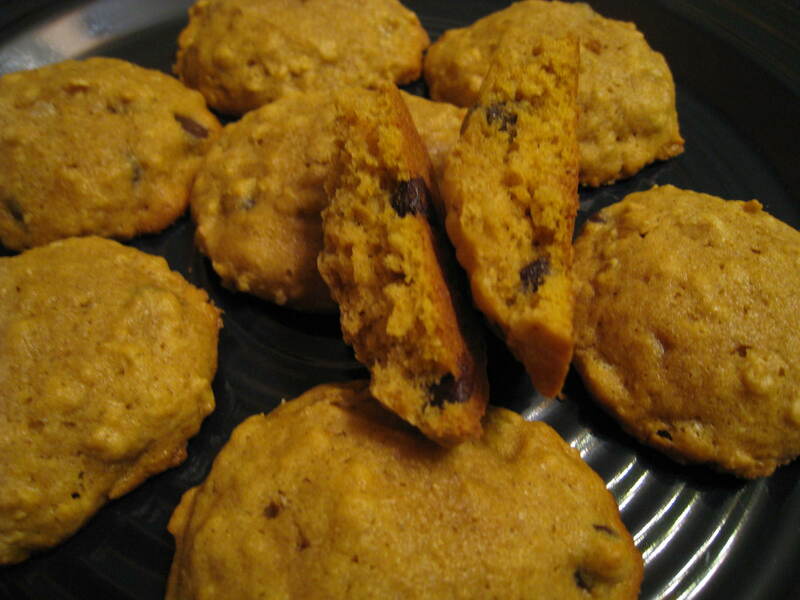 🙂 They are chewy like an oatmeal raisin cookie, but have an amazing pumpkin pie flavor and then to top of it off- chocolate chips! Seriously, these are really good and will be gone in no time if you make them! Preheat oven to 325 degrees. In a large bowl, combine butter, sugars, pumpkin and eggs until smooth with a hand mixer. Add the baking soda, cinnamon, vanilla and flours. Mix until combined well. Stir in the oats and chocolate chips by hand. Drop tablespoon sized dough onto an ungreased cookie sheet. Bake for 13 minutes and remove from oven. Let them sit on the cookie sheets for 1 minute before removing them. Place on a cooling rack to completely cool. ENJOY! These look heavenly. I will be trying them soon.